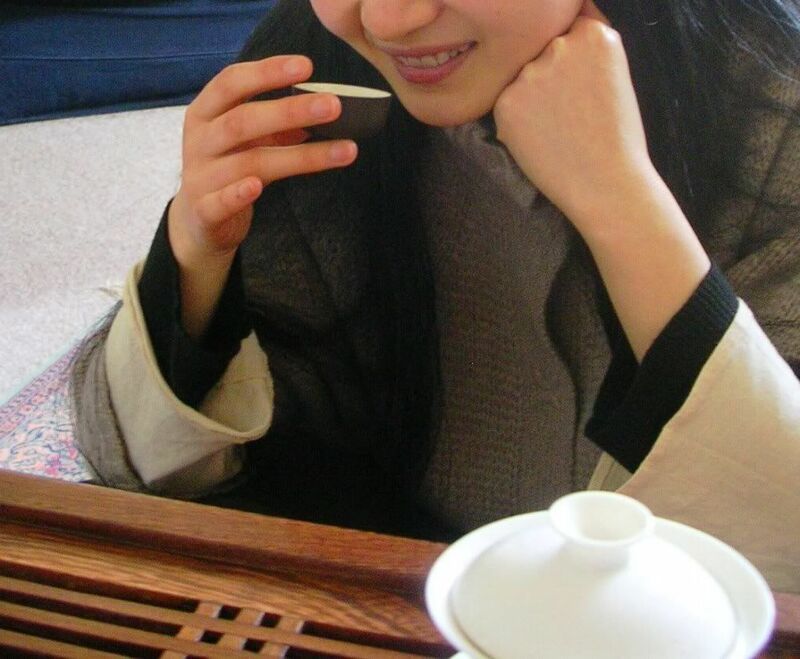 Having received a few letters of late on the subject of the dear wenxiangbei [smell aroma cup], I thought that a recent question posed by DV might be of general interest, and so (if DV will pardon me), I'll reply in open format. DV was interested in how Lei and I go about using our wenxiangbei, and this got me thinking about gongfucha in general - which led to the following article. I invite you to see what you make of it. 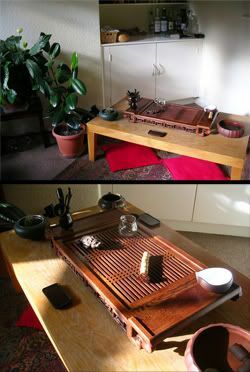 As with all aspects of gongfucha, the instruments and processes that one uses are very much an individual choice. In contrast to the Japanese chado, the Chinese chadao is much less prescribed. Which is "better"? I read this enquiry quite often. It is an answerless question: each method is complete within itself. The real question is, "Which is better for you?" This principle constantly informs my approach to tea (and most things in life, by extension). I note immediate similarities with the contrast between the formalised Japanese Zen school of Buddhism, and the somewhat less-prescribed Chan school of Mainland China (from which Zen derives, when Eisai imported the Linji/Rinzai school to Japan). I find many parallels between tea and Zen, and for me, to practice one is to practice the other - considering one in the absence of the other is like trying to separate the two sides of a sheet of paper. 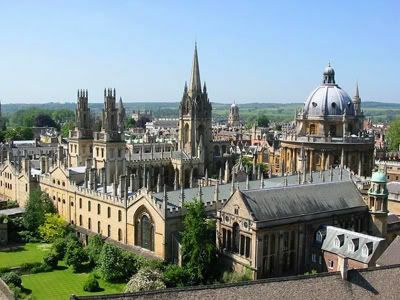 In Zen, practice is formal - most of the actions are prescribed (like a Christian Mass, in some churches - definitely here in Oxford). On this subject, the famous master Shunryu Suzuki said, "We have formal practice, but informal mind." The argument is that following a defined routine allows one to avoid the burden of working out what we do, instead concentrating on how we do it - allowing us to concentrate on the quality with which we conduct the actions. 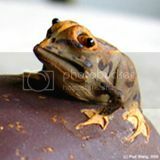 If I could commit a Zen sin by trying to surmise it in my humble words, I would say that Zen is all about "quality". In a world where quality is whittled away in favour of profit margins and rushed lives, Zen and Zen-like practices (such as drinking tea) become very relevant. The precise routine we choose should be made entirely on an individual basis - just as you would let no-one foist a religious belief on you, or adopt a religion simply because someone else does, so too should you evaluate your own method of brewing tea (and of everything else). "Learn the rules, and then forget them" is one of my favourite quotes. It was Basho's advice to his students in learning the rules of writing Japanese haiku poetry, and is habitually taught in painting, calligraphy, flower-arranging, martial arts, and tea. When Iwii and Tea Logic's VL came to visit Lei and I for a tea-meeting, both gentlemen expressed surprise that we made tea in rather a long-winded fashion. We wash and rinse, we pour and sniff, we juggle various cups and jugs. In the photograph, some of these are shown: from chaxi [water bowl for holding cups] to chahe [tea lotus, for holding leaves], to pots and gongdaobei [fairness cup], to wenxiangbei and pinmingbei [taste tea cup], ultimately to chagang [pot for used leaves and water] - it all looks like a bit of a fuss. However, like zazen or a Mass, it is natural to me, and each part of its whole has arisen to meet a specific need. Redundancy, pure aesthetism, has no home in something of "quality", in my eyes. Zen resounds with this principle. When Iwii brewed, when VL brewed, they did so with the consummate skills acquired through countless previous brewing sessions - but it was a different process. Though different in each case (and this is my rather tortuously-reached point), each brewing method has evolved to fit the character of its practitioner. None right, none wrong, all different. Some people distrust Zen and the more "formal" churches of Christianity because they find the ritual to be suffocating. I know some people who distrust Thai Buddhism or more "Evangelical" Christian churches because of what they perceive to be a lack of structure. Even within Zen itself, some people prefer Rinzai [meditating on koans/puzzles], while some are more suited to Soto [freeform "no object" meditation]. There are as infinitely many varieties of practice as there are practitioners, and each of us must find his own way (and thus find his own Way, so it is said). With that said, I return to DV's initial question, on the particulars of the wenxiangbei. For me, this has arisen because I gain a certain amount of information (and pleasure) from the wenxiangbei. I know some prefer to get this information from elsewhere - perhaps through the scent on a gaiwan lid, perhaps just from the soup of the tea itself. However, I use a gaiwan only for lucha, and so the need for a good source of aroma information has led to the need for the wenxiangbei. Here follow a few words on my own use of it - which, as I understand it, follows the Southern Chinese method (though I consider this to be a point of only subsidiary interest). In the light of my previous words, these are merely a description of how I make tea. Step i: The soup starts in the gongdaobei. Pour it into the wenxiangbei. Pictured top is a collection of wenxiangbei during a comparative tea-tasting session of two similar teas. Step ii: Place the inverted pinmingbei onto each wenxiangbei, so that they look a little like mushrooms. Then, holding the two cups together, turn them over so that the pinmingbei is the right-way-up, with the wenxiangbei sticking out of it, as may be seen in the second picture from the top. All of the soup should remain in the now-inverted wenxiangbei. Maybe a little tea will spill when one is first getting used to the technique, but it soon stops spilling seemingly of its own accord, as the action becomes unconscious. 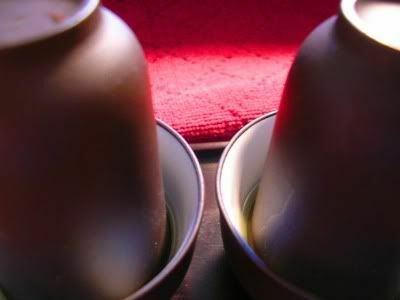 Sometimes, the grip of the cups to one another can be so strong that the pair can be held aloft by holding the wenxiangbei, as pictured second-from-bottom. Step iii: Pull the wenxiangbei upwards, so that the soup remains below, in the pinmingbei (as may be seen in the bottom photograph). This is where the aroma comes in, and it is entirely evaporative - the scent changes as more soup evaporates from the walls of the tall wenxiangbei, giving layers of information. Putting the nose inside the cup (as in wine-tasting), the initial aroma that arrives is the beidixiang [cup bottom scent]. It contains the "high" notes of the aroma, which are the shortest-lived in duration. These are often caused by initial leaf sweetness, and by the floral characteristics of oxidation. This beidixiang will vary in duration depending on the potency of the tea, giving further clues as to what to expect of the endurance of the tea in the mouth and throat (termed the "patience", in some spheres). An obvious change often occurs, as the short-lived beidixiang vanishes, and hands over the longer-duration scents of the lengxiang [cold scent], so called due to the cooling of the wenxiangbei. These are the "low" notes of the aroma, and often relate directly to the roast of the leaf, or its lingering sweetness (which can be a clue to the huigan). This transition from "high" to "low" characteristics is often played out in similar form in the mouth, with the "high" flavours appearing as the tea enters the mouth, and the "low" flavours appearing as the tea progresses to the throat. Relating the wenxiangbei to the pinmingbei can provide plenty of mutual information, and this is my primary reason for its use. They are the yin and yang of my tea-tasting experience, respectively. I've got a theory about about why the beidixiang differes from the lengxiang, but it's just a theory: The beidixiang carries the water-soluble parts of the aroma, and the lengxiang comes from the oil-soluble part which remains coating the cup after the water evaporates...what do you think? I tend to liken the evolution that takes place in the wenxiangbei to that body of knowledge accumulated by the perfume industry, in terms of relating high-yet-short aroma ("head notes" in perfume parlance) to low-yet-enduring aroma ("body notes"). However, they say little about the physical make-up of the aroma, whether it be oil- or water-based. As a technically-minded soul, you need no reminding how little we know of the human sense of smell - our recreations of the human olefactory systems are empirical at best, requiring pattern recognition techniques (three cheers) to train even the simplest somelier robot. I have often mulled over the possibility of creating a classifier for tea and cheese aroma, but I don't think our actual understanding of the physical processes are there yet. A well prsented offering,and enjoyable read. I find myself in the “Less is more” camp. Only in Taiwan or with my Taiwanese friends do I see the use of double cups. I use it only to demonstrate alternate process or give my friends an additional roll to play. In the bazillion tea shops in the mainland, I have only seen it used in one. That shop is in Kunshan, (near Shanghai), owned by a couple from Fujian, serving mainly Taiwanese business men. I saw it a fair bit around Sichuan, interspersed with the omnipotent big gaiwan, but I've not had the opportunity to peruse Guangdong or Shanghai yet. Less is, without doubt, more! Thanks for all the info! Connecting the patience of the tea with the lingering smell in the aroma cup, is something I probably would have never noticed. I'm with John on this one -- I find the use of it cumbersome, and the same information can largely be gotten from the fairness cup or the drinking cup, or the lid, as the case may be. I just find the whole pouring, roll it over, drinking thing too much of a bother, especially when I'm drinking by myself, which is most of the time. An extremely beautiful post. I am continually awed by your ability to convey complex information so naturally and readably. I learned not only new Chinese words, but also some English. I love the word foist, I had used it before only in sillily pronouncing "first." Great entry! However, I'm with John and Marshaln on the use (or non-use) of wenxiangbei. In fact, if I can skip using the chahai so much the better, though it is not as easy to avoid it. When with guests, my modus operandi is to suggest to all drinkers present to return their pinmingbei's onto the tea tray, and preferably standing lip-to-lip. Then I do the qingting dianshui in continuous circular fashion to ensure equal volume and tea concentration in every cup. The chahai is only used for any excess tea in the teapot. However, occasions arise when guests do not return the cups onto the tea tray. Then the chahai is used as a fairness utensil, with which I extend my hand in order to pour into the guests' cups. All in all, there is no wrong or right way. I agree with you completely on this point. Though those are often present on my tea table, I rarely use them. Sometimes with oolong, at times with Pu-erh, but not as a matter of habit. speakfreely's explanation seems quite interesting, this might also explain why sometimes this "cold" aroma is best extracted when the cup is slightly cooler. I sympathise with the point-of-view that it seems like a lot of bother, because I have two methods of drinking tea. The first is in my office, using my miniature tray. In this mode of drinking, I simply brew-and-drink, because I'm working (notionally speaking). This is the mode from which I sympathise with your comments, because I have no time for proper appreciation while working - I only use my less special teas in this case, as they seldom get my full attention. However, the other mode of drinking is sitting at our table at home. Here, there is already separation from the working world. In order to sit on the floor, we leave the world behind - its placement is quite deliberate. When I sit down, I necessarily have the time to have a proper session, and so the notion of "too much bother" doesn't really enter into mind (for me). Perhaps the reverse, it gives my mind something on which to focus (like jingzing/kinhin, for Zen readers). You touch on a fundamental point, that whether practice is formal or informal in style, one still needs a teacher to guide our paths. In gongfucha, perhaps by dint of China's turbulent history, or perhaps due to the disparate, almost Continental scale over which the country is spread, there is no firm teaching on chadao - it is evolutionary, and uncodified to a large extent. We have some classic works, we have the way that people make tea locally, but there is no Sen no Rikyu telling us how to make tea, which is universally practiced. There is no universal gongfucha practice, and that is its genius. What we do have is lots of good opinion, lots of alternatives, and lots of potential people from whom we learn. We cast about for opinions (hence, for me, the usefulness of tea writers on the Internet), we weigh them for ourselves, perhaps we try them out, and our own practice evolves. Perhaps you'll allow me to describe my own particular experience with the learning process for gongfucha. One of the worst cultural crimes that an Englishman can commit is not knowing the protocol for a given situation. We're terrified by doing "the wrong thing". Knowing the etiquette for a given situation is the requirement for gentlemanly manners (which, despite the dilution of modern culture, still seems important to the majority). So, etiquette rules a fairly large portion of our lives: when we go to church, we are obsessed with making sure we kneel or bow in the right place. When we pour wine, we make sure that we pour to guests in the correct order. When we eat in company, we make sure that we navigate our way through the maze of cutlery and glassware in the correct order. What this means, when it comes to setting out on the road to gongfucha, is that we have an innate desire to "get it right". This was exactly how I started out, and it took me a long time to learn that there really is no right way. There are no teachers with ultimate authority in tea: the chajing is non-prescriptive; the "tea masters" are, at best, masters of their own locale and, at worst, charlatans out to make a quick buck by printing you a meaningless certificate. I rather like the lack of authority - as I said, it's the genius of gongfucha. It causes us to reason very carefully about the way that we do things. If something is redundant, we drop it. If something is useful, and fits with our spirit, we keep it. "In the land of the blind, the one-eyed man is king." In gongfucha, we have no two-eyed men, - there are no authorities. Just lots of partially-sighted one-eyed men, and we weigh their opinions to improve our own skills. And there is the key: the control is in our own hands, in the absence of teachers. Your method of brewing represents one of the other large tendencies in gongfucha, does it not? The direct pour from the pot into the tasting cups is quite common. There really is an infinite continuum of brewing methods, from drinking-out-of-the-gaiwan at the most informal stage, up to the maximally formal stage (which is where I think my tea-table sessions fall). Ah! Not using wenxiangbei with gaoshan wulong would be difficult for me... there is so much pleasure to be had in that tall little cup. We took tea with an Indian friend, I think it was the Taiwanenese Dayuling gaoshan wulong. He said, "I like the flavour, but I find that I get most of my enjoyment from this aroma vessel"! "The direct pour from the pot into the tasting cups is quite common." By far as I have observed among tea vendors, friends and others, the pouring from teapot into the chahai is far more common than the performance of qingting dianshui in continuous movement. What I'm saying is my preference is very common, but not as common as using chahai as the fairness tool in my (limited) observation. My master called the usage of chahai to ensure equal volume and concentration "the lazy way". He told me the qingting dianshui requires utmost grace, concentration and timing...all cups must be equal in the end without spilling a single drop of tea onto the tray if possible. Now that was his opinion because he was a martial artist. I personally think each method has its elegance and significance behind every movement. I never thought of using the chahai as cumbersome...in fact, it is the opposite. Wenxiangbei, in my personal view today, whch may or may not change one day, is redundant, however. You're absolutely right that there's no right way. In fact, there's no way at all -- you have to find your own. Gongfucha as we practice it today is a fairly recently popularized method of making tea. Three decades ago, very few people, aside from some who resided near Chaozhou area, brew tea the way we do now. They usually do the "cups next to each other and pour straight from pot", which is also my preferred way if I have guests (the pot gets too big for one person). The fact of the matter is that what we now consider "traditional" brewing methods is actually quite new and modern in its current incarnation and popularity. The aroma cup was one of those things that, IIRC, the Taiwanese contributed in their adaptation of the gongfu method. There's a good reason for it -- as you just said so yourself, for gaoshan oolong the aroma is more enjoyable than the taste in the cup.